SCC Open Carry Fishing Trip | South Carolina Carry Inc. 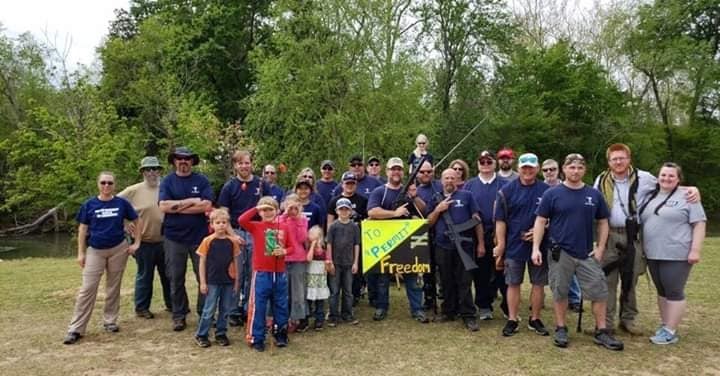 In March of this year, members of South Carolina Carry, Inc. began planning an inaugural open carry fishing trip where we would open carry long guns and pistols. Our organizers spent several weeks planning this event, which included applying for event permits from both Columbia and West Columbia, and sending press releases to all major news outlets in the Midlands area. Our organizers arranged for parking at a central location so we could open carry on a route that would take us by the State House. Less than 24 hours before the actual event we were notified by the parking garage near the State House that they would be posting no weapons signs and shutting down the garage to the public on the day of the event. It would seem that someone from the Moms Demand Action group learned of our event and our parking plans. They called the city of Columbia Police Department to verify this was not a hoax. Our organizers received a call from the city of West Columbia the day prior to the event denying our permit to demonstrate on their side of the river in West Columbia due to a previously scheduled event on their side of Riverfront Park. We were informed by CPD that DNR officers would be on hand to check everyone’s fishing license during the event. Despite these setbacks, our members were not deterred, and on April 6 members of South Carolina Carry traveled to Riverfront Park in downtown Columbia. Several members traveled on foot carrying long guns from Senate Street down to Riverfront Park while several others met at the parking log of Riverfront Park. Even though one of the organizers received a call from a major with CPD the morning of the event stating that if we intended to go forward with our open carry march we would be arrested, our walkers, who were open carrying both long guns and pistols, were escorted by City of Columbia police vehicles the entire route with no issues. Several police officers were staged in the parking lot of Riverfront Park keeping an eye on our gathering. Chief Holbrook even showed up and stood with his group of officers. We went as a group from the parking lot at Riverfront Park down the sidewalk to the Congaree River and began fishing and fellowship. On several occasions, we had folks who walked passed us by the water and started to talk to us about what we were doing why we were carrying guns. We educated them about current South Carolina laws regarding open carry of long guns and open carry of a handgun during fishing or hunting activities. We observed several citizens who stopped to talk to our police escorts and questioned our activities. The officers took the time to explain that it was not illegal and told them what we were doing. A good time was had by all. We were able to meet new people and match faces with names of those we interact with on the SCC web forums and Facebook groups. We enjoyed exercising our 2nd Amendment rights and the opportunity to show the citizens of Columbia that open carrying of firearms by law-abiding people did not end up with anyone getting shot. Our next open carry event will probably be in either Greenville or Charleston. Once the details are firmed up and the event has been organized we will communicate the time and date on our blog, Facebook page, and yes, another press release that will most likely not get published. We hope to see you there!